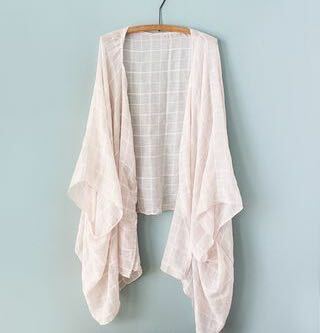 There is this really cool DIY tutorial I found about making a kimono from a large scarf. It’s amazing, incredibly easy and doesn’t have to cost much. All you need is a big scarf, maybe you have one you don’t like as a scarf too much anymore or maybe you can buy a cheap one. Even the sewing is really basic. Anyone can do it, and that’s exactly what I like about this tutorial. So here’s what the tutorial is about. You take the scarf, fold it in the middle one time and make sure everything is perfectly aligned. Then you sew the two sides together from the middle to the bottom. Leave openings: that’s where the arms go. Then you cut out the neck and the opening on the front, sew all the edges and voilà! The amazing thing about the tutorial itself is that it’s in video format, so you can see exactly what they’re doing and follow them along the way. Quick, easy and fun! Check out the video on Wonder Forest.